The NANOPTO group at ICMAB is searching a physics/nanotechnology graduate or an engineerto work with them in the design and fabrication of photonic crystal. The Superconducting Materials and Large Scale Nanostructures (SUMAN) Group offers three PhD fellow positions in the following topics: Ultrafast growth of thick superconducting epitaxial layers from transient liquids; Atomic structure imaging and analyses of YBa2Cu3O7-x thin films and nanocomposites, and Superconducting properties and vortex pinning mechanism of layers prepared by ink jet printing combinatorial chemistry. The recruitment process will be closed when a suitable candidate is found. Postdoctoral researcher offer entitled: Atomic structure imaging and analyses of YBa2Cu3O7-x thin films and nanocomposites in the Superconducting Materials and Large Scale Nanostructures (SUMAN) group. Position offered: Postdoctoral researcher (2 years contract). The recruitment process will be closed when a suitable candidate is found. Within the Severo Ochoa programme, 4 PhD fellowships are offered by theICMAB-CSIC for the academic year 2018-2019. Check out the available projects and apply now! 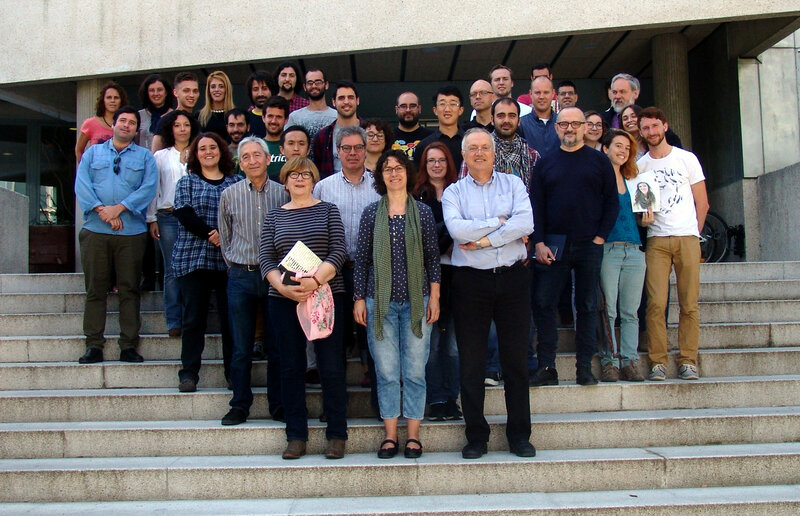 The group of Dr. José Vidal, in the NANOMOL group is looking for a "Posdoctoral Researcher in Radical Dendrimers as Contrast Agents for MRI". The appointment has an initial duration of 1 year, starting in Oct 2018. The activities of the successful candidate will focus on the synthesis and characterization of radical dendrimers and their study as paramagnetic contrast agent for Magnetic Resonance Imaging. Written by jags on 09 May 2018 . Written by Anna May Masnou on 30 April 2018 . Written by Anna May Masnou on 15 March 2018 . A postdoctoral research position is offered within the framework of the project “Finding a needle in a haystack: efficient identification of high performing organic energy materials(FOREMAT)”, funded by the European Research Council through the program ERC-Consolidator Grant. The appointment has an initial duration of 2 years, starting in May 2018. In the Crystallography of Magnetic and Electronic Oxides (CMEOS) group with Dr. Xavier Torrelles. Deadline: 15th January 2018. Written by Anna May Masnou on 14 November 2017 . Written by jags on 03 November 2017 . Written by jags on 04 October 2017 . This project is part of the ERC Advanced Grant ULTRASUPERTAPE which aims to demonstrate an unprecedented approach for fabrication of low cost / high throughput / high performance High Temperature Superconducting (HTS) tapes, or Coated Conductors, to push the emerging HTS industry to market. Written by jags on 19 September 2017 . The First Call of the COUFND Marie Skłodowska-Curie DOCtoral training programme in Functional Advanced Materials (DOC-FAM) will open on October 1st. In this call, a total of 11 fellowships are available to Early-Stage Researchers (ESRs) in order to conduct a PhD in one of the research centers involved in the programme, for a total of 36 months. Written by Anna May Masnou on 31 July 2017 . The group is looking for a PhD Researcher to participate in the development of a National project entitled “Boron cluster based materials for sustainable energy and environmental applications”with Prof. Clara Viñas and Dr. Rosario Nuñez as Principal Investigators. Written by Anna May Masnou on 25 July 2017 . 30 postdoctoral fellowships at Universities and Research Centres of Spain are offered through the Junior Leader Programmefrom “la Caixa”, which is aimed at hiring excellent researchers—of any nationality—who wish to continue their research career in the Spanish territory on any discipline. Written by jags on 11 July 2017 . Ya se encuentra publicada la resoluciónde concesión de las becas colaboración Severo Ochoa y María de Maeztu 2017-2018 en la web de la convocatoria. La fecha tope de envío de aceptación de las ayudas es el 25 de julio. Written by jags on 06 June 2017 . Written by jags on 25 April 2017 . Written by jags on 25 January 2017 . Written by jags on 23 January 2017 . Written by jags on 10 January 2017 . Written by jags on 11 November 2016 . Written by jags on 01 November 2016 . Written by jags on 28 July 2016 . Closing date: 30th August 2016. We offer a PhD position working within the framework of a European ERC StG project and “Explora Ciencia y Explora Tecnología” project. The contract will be for 3 years, approximately starting date September 2016.